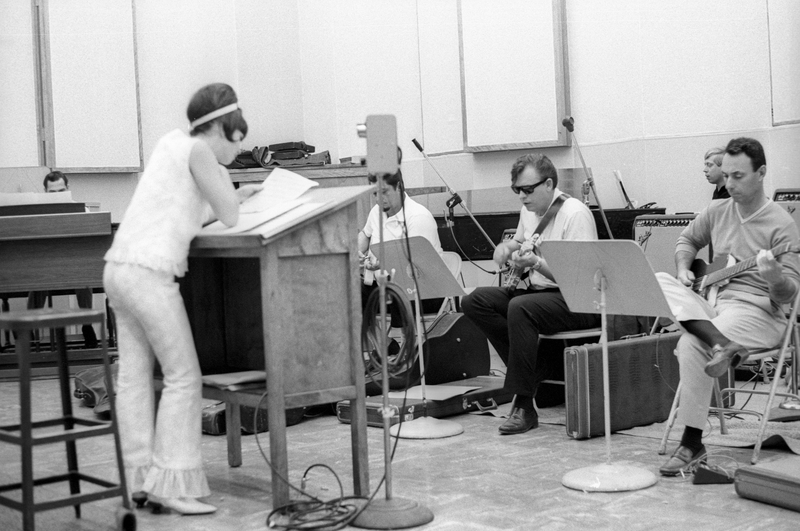 Here’s a photo from July 6, 1965 in Studio A at the Capitol Records Tower. I’m wearing an outfit that I designed and made, a 2-piece Pink Polka Dot bell bottom pants and top. Pictured, from extreme left: Al DeLory on organ; me; Tommy Tedesco, guitar; Billy Strange, guitar; Don Randi, keyboard; mystery man, bass. Anyone know who the mystery man is? **Thank you, Cliff Adams for recognizing the great Bill Pitman on bass. This session included the following recordings: Smokey Joe’s (released 11/65), That’s The Boy (finally released as part of a compilation in 2009) and four other unreleased tracks, all produced by Steve Douglas. Arrangers for the session were Billy Strange and the legendary Jack Nitzsche. Oh Wow ! Donna !! Those are the coolest and grooviest bell-bottoms from the sixties. I know you are so proud that they still fit you so perfectly. Thanks for the update on the sixties Wrecking Crew. I have always admired those wonderfully talented musicians. Bassist Joe Osborn is 75 years old now, and has just produced and played bass for a teenage prodigy Matthew Davidson for his debut recording. Sweet Caroline – Neil Diamond – Good times never seemed so good ! Woman In Love – Carola Haggkvist – Life is a moment in space ! I only want a morning smile and a kiss goodnight ! That’s What Love Is Made Of – Donna Loren – Sugar and spice everything nice ! The Girl Next Door – Johnny Crawford – Lived in a great big white house ! Into My Heart – Donna Loren – You must come into my heart ! A little love that slowly grows ! Not one that comes and goes ! That’s all I want from you ? Why did our mother’s love die ? That’s All I Want From You – Johnny Crawford – A little love ? Johnny’s here Donna ! See You Real Soon ! At our New Jersey Singers Expo Oct 28-30 ! Love me please just a little bit longer ? All I ever wanted was to have you all to myself ! Then I saw you with someone else ! Together we can make it ! Our love is much to young to break it ! Oh! where did you go Johnny ? Hurricane Sandy Charity Benefit Concert ! Let’s All Change The World Together ! How To Help Hurricane Sandy Victims ! Thanks for dressing to 6 & 7’s for me ! Don’t Cry For Me Argentina – Sarah Brightman – The truth is I kept my distance for your fame ! It will take a miracle, but someday maybe I’ll find ! Losing You – Dusty Springfield – Someday, I won’t mind losing you ! You are the lovely one , I am the lucky one , you bring me joy ! Beautiful Boy – Jared Lutes – Oh ! I need you ! I’m the lucky one ! Everyone has a story of not loving someone, as much as, they love you ! Untammed Heart – Kalsey Kulyk – Just give him one more kiss ? The secret way you hold my hand ! Let’s me know you understand !